Untreated, stones may block the flow of urine, leading to serious complications, including damage to the bladder, kidneys, uremic poisoning, and even death. Neurogenic bladder, a nerve disorder that can cause urine retention. Kidney transplants, because of the likelihood of urinary infections. Urinalysis to determine if infection is present and if there is blood in the urine. 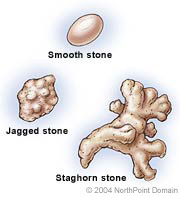 All urinary stones should be treated to avoid serious, even life-threatening, complications. 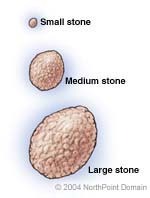 Most small stones eventually exit the body on their own. For this reason, a patient with small stones is usually instructed to drink as much fluid as possible to help flush out the stone. 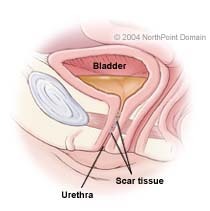 If necessary, the physician can remove the stone using a cystoscope or other instrument inserted in the urethra. Another option, lithotripsy, creates sound waves outside the body to pulverize the stones inside the body. The physician may also recommend treating underlying conditions associated with bladder stones. For example, prostate enlargement can be treated with transurethral resection of the prostate, or TURP, a surgical procedure that shaves away layers of prostate tissue. Copyright © 2018 NorthPoint Domain, Inc. All rights reserved. This material cannot be reproduced in digital or printed form without the express consent of NorthPoint Domain, Inc. Unauthorized copying or distribution of NorthPoint Domain’s Content is an infringement of the copyright holder’s rights.